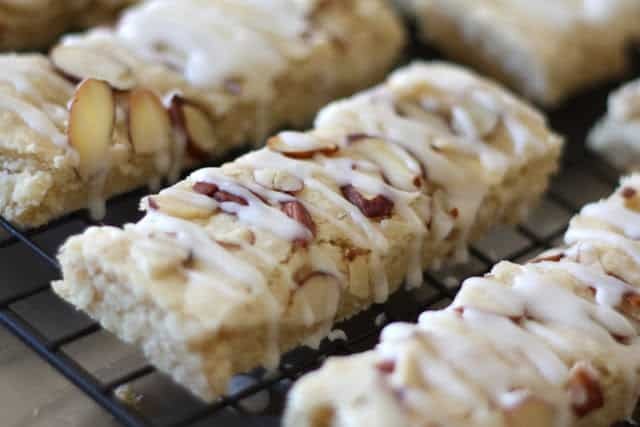 Flaky, tender, almond flavored shortbread bars are topped with sliced almonds and drizzled with a very light glaze. These bars are the most requested baked good that I make. Luckily, they keep perfectly in the freezer, so I can quadruple the batch and store them until I need them. 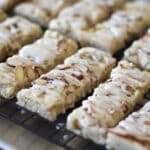 I’ve been making Scandinavian Almond Bars for several years now, however a gluten-free version has been my nemesis for over two years. I’ve bombed at least 2 dozen batches of these trying to get the texture just right. It is making me laugh that success finally happened through no brilliance on my own part. I had planned to try yet another variation, when I realized that I had run out of the flours I planned to use. I simply grabbed the remaining oat flour in the pantry and added it in. The bars were wonderful! Slightly more nutty with the mild flavored oat flour and a tiny bit heartier than their predecessor, these just might trump the original for my own personal favorite. your fingers or a pastry roller to smooth the top of the dough. The gluten free dough is a bit stickier than the traditional version. I found that it was easiest to place a sheet of parchment or wax paper on top of the dough and press it into the pan with my hands that way. pastry brush, brush a tiny bit of milk across the top of the dough. still frozen, because they are easy to handle that way. Enjoy! Mary I adore almond extract - it is so tempting to put it in everything! You have really worked hard this year adapting recipes for gluten free perfection. These are beautiful and I bet they are enjoyed by everyone! Lovely recipe. Don't you just love it when you finally get a recipe to work perfectly!! Nicely done.. these look amazing! I made these bars, dark chocolate almond fudge and peanut butter fudge for Christmas. Thanks! I made these....they are to die for! I'd like to make these, they sound delicious. But the quantities of flour have me a little perplexed. The GF flours add up to 2 1/2 cups, vs the 1 3/4 cups of all purpose flour. Yet you remark that the GF version tends to be sticky. Are these amounts correct? I've put enough sad experiments out for the birds to be cautious. I understand your hesitation completely. I played with this recipe for over two years before I was happy with the GF version. The measurements as you listed them are correct. It simply requires a good bit more flour to make the GF version hold together and create the shortbread texture that I love. I hope that helps! Looks divine and I am sure they taste divine also. These are amazingly good! Thanks!! Is there a non gluten version? They look wonderful, but I'd rather not go buy those ingredients that I usually don't use. Thanks. 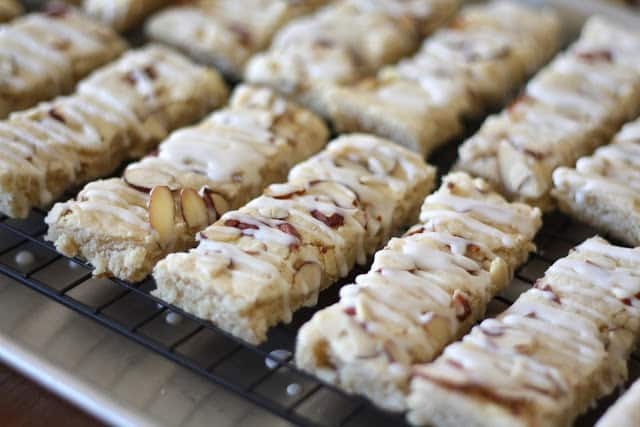 Yes, here's the traditional flour recipe: https://barefeetinthekitchen.com/almond-bars/ Enjoy! They look so delicious and was going to make them, but hardly had any of the ingredients. I'm not going to go out and buy all those ingredients. Sorry! Why would you even comment this? Just keep searching for a recipe you can make then! I was wondering if you have tried coconut flour or quinoa flour? Without having tried your specific GF blend of flours, I have no way of knowing exactly how much you might need. Shortbread recipes are typically a bit fussy when converting to GF. I made these many times before the blend of flours that I used gave me results that were equal to the original. If you do try it with your blend, let me know how it turns out. Happy baking!